JJ Villard’s Artful Chaos Reigns Supreme in “Animation Sketchbooks” and Kickstarter Update! : COMICS ARE EVERYWHERE! JJ Villard’s Artful Chaos Reigns Supreme in “Animation Sketchbooks” and Kickstarter Update! 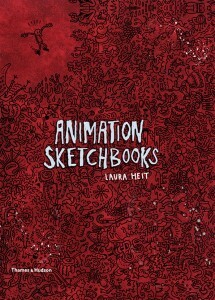 Laura Heit's new book Animation Sketchbooks features the artwork of JJ Villard and other avant-garde animators working today. Did you ever wonder what makes an avant-garde animator really tick? Author Laura Heit’s new book promises to answer that question by cracking open the door behind the frenzied creativity driving some of the most innovative animators working today. Published by Chronicle Books, the epic, 320-page tome is appropriately titled Animation Sketchbooks offering an insider’s perspective on the animation process at its most humble beginnings. Each of the book’s chapters is devoted to a unique voice of independent animated filmmaking. As you flip through the book, you can vicariously experience the inner sanctums of inspired, artistic minds conjuring up all sorts of bizarre imagery on paper. The twisted visions writhing on the pages of sketchbooks were ultimately destined to blossom in the artists’ personal, idiosyncratic animations that are a far cry from Pixar’s assembly line of family-friendly, cinematic products. No wonder Heit launched her own blog to get readers pumped up for the release of her coffee-table-sized art book showcasing the likes of such avant-garde animators as Martha Colburn, Brent Green and Oscar-nominated animator Don Hertzfeldt, among others. Fortunately, I picked up an advance copy of Animation Sketchbooks at Chronicle Books’ booth at this year’s Comic-Con and you’ll be able to find copies on Amazon or at your local book stores. Chaotic images run rampant in the pages from one of JJ Villard's multitude of sketchbooks. Of course, no book graced with the comprehensive title Animation Sketchbooks would be complete without prominently featuring an image-rich selection of pages ripped from the crazed sketchbooks of JJ Villard. The book also includes artwork from the artist’s animated short-film collection Son of Satan inspired by the late Charles Bukowski’s wine-soaked, autobiographical short stories. Frequent readers of my blog are already cognizant of Villard’s role as one of the principal characters in the daring documentary-in-progress, Comics Are Everywhere! Once again, Comics Are Everywhere is ahead of the curve when it comes to exploring the creative and offbeat artworks by adventurous artists who delight in throwing caution to the wind as they thrive on the cutting edge of the popular arts. We hope you will become a backer for the Kickstarter campaign for Comics Are Everywhere! as our August 17 deadline fast approaches! Join us on a comic-book-inspired Magical Mystery Tour of pop-savvy artists, skilled writers, and crazed animators run amok like Villard as the creative team behind Comics Are Everywhere! continue to seek the necessary funds to complete this ambitious film project! Join us to help bring this dream project to fruition!